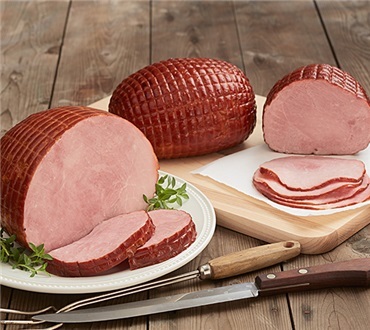 Cut in one solid piece from the best part of the ham, this "filet mignon of hams" offers unsurpassed cob-smoked flavor that's 98% lean - leaner than most poultry — and ready to serve convenience. Splendid for dinner, salads, and hors d'oeuvres. Fully cooked. Estimate 1/4 lb per person buffet style or 1/2 lb per person for dinner, depending on appetites. I was hoping that this would be a nice textured ham for slicing and snacks. I found the ham to be dense and very salty. Because of the texture it does not slice very well unless you use a serrated knife. The saltiness was okay when paired with a strong cheese. I will use the rest in soup but make sure to add no salt. We received this ham as a Christmas gift. Have always enjoyed Dankin products. However the ham we received was inedible. It was tough and chewy with a funny flat flavor. We threw it out and vowed to avoid the hams. Nice lean great tasting ham! I have purchased hams from you many many times. I do not know what has happened, but this ham was so salty I could not eat a single serving! I am unsure if this was a one time problem or if you have changed your recipe since my last ham order.